An electronic health record (EHR) can streamline the exchange of resident health information during transitions of care between acute care and skilled nursing facilities (SNF). Despite long-term care providers not qualifying for funds such as those offered by the meaningful use program, an EHR has many benefits, including improved workflow processes, data analysis, and documentation accuracy—all of which contribute to increased quality ratings. As such, many facilities have EHR adoption at the top of their priority list. 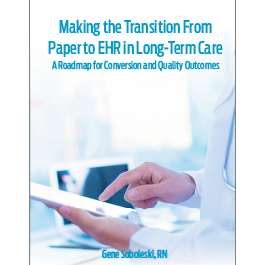 Making the Transition From Paper to EHR in Long-Term Care: A Road Map for Conversion and Quality Outcomes takes the mystery out of the transition from paper to EHR, ensuring a smooth conversion process. Long-term care providers can use this guide to increase integration between multiple software formats, understand best practices for selecting an EHR vendor, train multiple levels of staff on all the EHR’s benefits, and leverage EHR data to improve QAPI processes and quality of care. Gene Soboleski, RN, came into nursing from a telecommunications/IT background. During his 15 years in nursing, he has worked in hemodialysis, pre/postop, emergency room, ICU, nursing informatics, and occupational health and wellness. While working within the Veterans Administration (VA) healthcare system, Soboleski was responsible for integrating external equipment and applications with the VA’s EHR. In his spare time, he enjoys distance running and coaching young athletes in football and basketball.